Medieval Calvary cross at Great Mitton, Lancs. OS Grid Reference: SD 71555 38958. 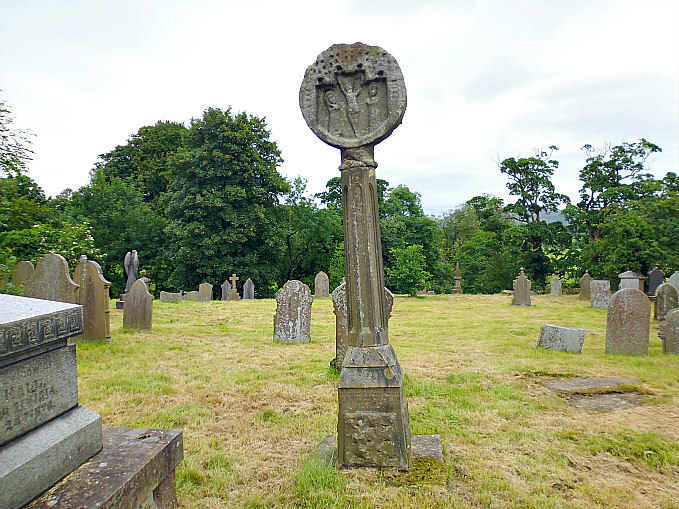 In the churchyard of All Hallows parish church at Great Mitton in the Ribble Valley, Lancashire, stands a late Medieval round-headed calvary cross which is beautifully carved with scenes from the crucifixion of Christ. 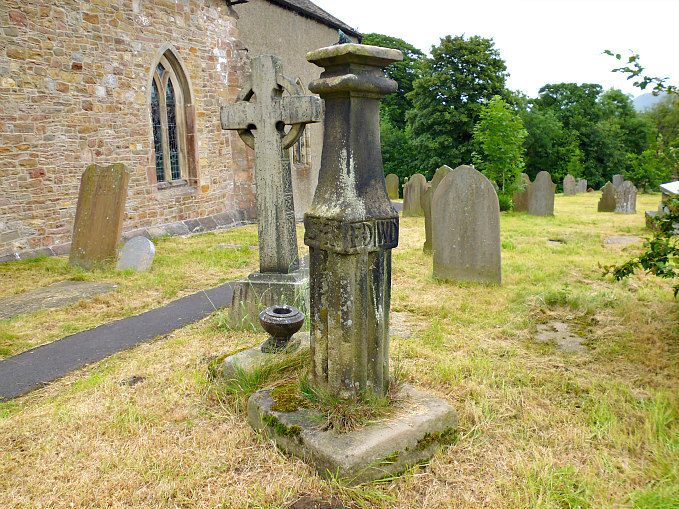 The long tapering shaft and base of this Grade II listed monument are, however, more recent in date, but the sculptured cross-head is ‘still’ a very wonderful sight to behold. It may have originated in one of the local abbeys that were destroyed at the Dissolution. And close by there is another monument: a very delightful late 17th century sundial with a curious inscription running around its shaft. The church of All Hallows can be reached from the B6246 – some 2 miles northwest of Whalley. A short distance after the Aspinall Arms public house and the River Ribble the church is almost on the corner of Church Lane where the entrance to the churchyard is just around the corner, hidden in the trees on the right-hand side. Churchyard ‘Calvary’ Cross, (West Face). Churchyard ‘Calvary’ Cross, (East Face). 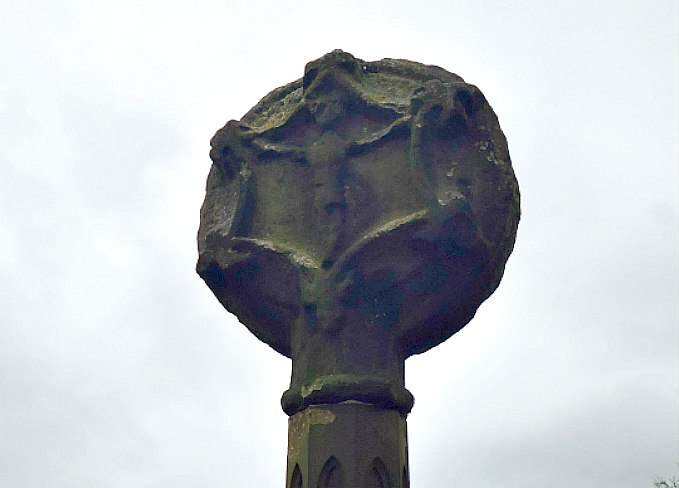 This 14th century round-headed sandstone calvary cross is mounted on a long thin octagonal shaft that tapers away near the top and has a squared base bearing an inscription; both the shaft and base date from the mid-1800s. The original shaft has long since gone. It is often referred to as being of the Gothic period. 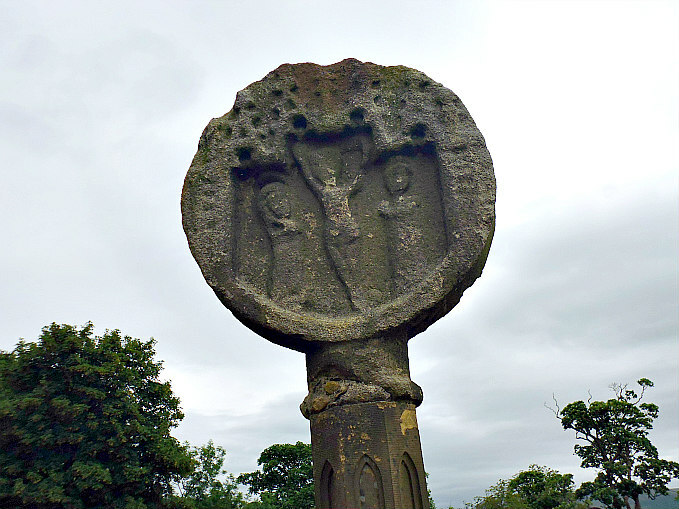 On its W face there are three figures: Christ crucified in the centre with St Mary Magdalen and St John the Evangelist at either side of him, while the E face has a rather eroded figure of Christ on his own and crucified. Below that there is foliage. Both sides of the cross-head have tracery. All in all this is a very beautiful Christian monument and all credit to the mason who carved it. But I do think it should be placed inside the church in order to preserve it from the ravages of the weather. It is uncertain from where the cross-head originated but it could have come from either Whalley or Sawley Abbey. It would seem to be in this case, though, that it was actually brought from Cockersand Abbey, Lancashire; and in more recent times it was rescued from the bed of the nearby River Ribble, where it may have been hidden by the monks who from time-to-time resided at Mitton Hall, just opposite the church. Some of the wooden furnishings inside the 13-15th century church of All Hallows did indeed come from Sawley Abbey, near Clitheroe, after the dissolution of that religious house in 1536. Cockersand Abbey in north Lancashire was dissolved in 1539. The square base of the calvary cross-shaft has a Victorian inscription recalling the XIII hundredth year of the introduction of Christianity. The cross is now a Grade II listed monument. Also in the churchyard a sundial on a thin shaft, dating from 1683, which has a brass gnomon and plate, and an inscription in large ornate letters and numerals running around the bulbous middle section of the shaft. Sundial in All Hallows Churchyard. Bottomley, Frank, The Abbey Explorer’s Guide, Kaye & Ward Ltd., London, 1981. Dixon, John & Phillip, Journeys Through Brigantia (Volume Nine) The Ribble Valley, Aussteiger Publications, Barnoldswick, 1993. © Ray Spencer, The Journal Of Antiquities, 2017. Categories: Ancient Crosses | Tags: Churchyard Calvary Cross at Great Mitton in Lancashire | Permalink.